We get it—there are some nights when you don’t feel like going out. All you want to do is stay in and bask in the comfort of your own home. But what do you do when this need to be a hermit coincides with a fierce craving for sushi? If your answer is to make your own sushi, you’re in luck! In today’s blog, we at Nikko Japanese Restaurant are going to give you some tips to make homemade sushi. Although we highly doubt, you’ll be able to create the type of delicious sushi that we serve—no offense, it’s just that we’ve spent decades perfecting the art of sushi making. It’s not arrogance, just matter of fact. Our pursuit of sushi perfection has earned us the reputation of having the best sushi in Charlotte. 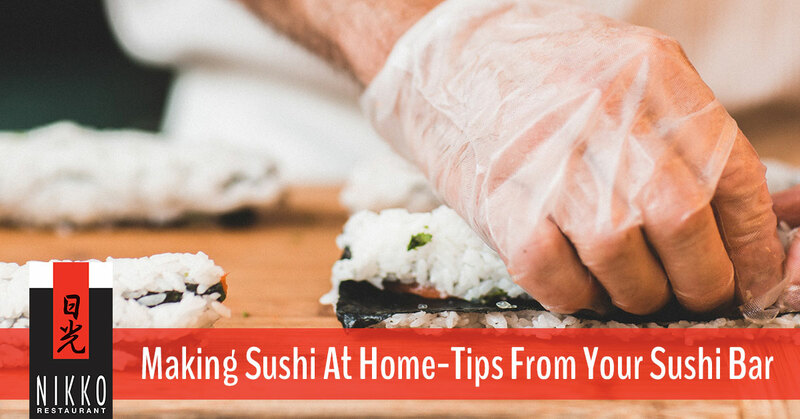 Making sushi at home can not only be a fun activity but it can also be the way to a delicious dinner.If you decide to create your own rolls, follow these steps. Rice is an essential component of a quality sushi roll. Though it does not take that long to prepare rice, it is actually the most time-consuming part of the process. If you have a rice cooker, this is your surest bet for making quality rice. If you don’t, you can combine rice with water—roughly two cups of water to a cup and a half of rice. Let the rice simmer for 20 minutes and then sit covered for 10. Stir the rice regularly and make sure that it doesn’t dry out. An essential part of making great sushi is nailing the rice-seasoning process. To season your rice you will want to add ⅓ cup of rice vinegar. Pour over rice, fluff with a fork, and adjust the taste to your liking using salt, sugar, or more vinegar. Not sure about this whole DIY sushi thing? Come on down to Nikko Japanese Restaurant and Sushi Bar. You don’t have to do any cooking. All you need is to bring your appetite for some of the best sushi in Charlotte. Prepare protein as you see fit, and then after cleaning your veggies, you will want to slice them vertically into little matchsticks. Before you start rolling up your sushi rolls, there are a few things to take note of. Firstly, to avoid a mess, wrap your bamboo mat in plastic wrap. Secondly, you have to decide whether you want your rolls to be wrapped with nori on the outside or inside. If you are new to this, we suggest starting with the seaweed on the outside. Arrange your ingredients on your mat—seaweed, rice, and then toppings in the center. Though this next step is hard to explain, it’s quite easy to do. Roll up your ingredients, squeeze after you have rolled approximately ¼ of the mat, and then unfold the bamboo mat. Repeat this process until you have a nice tight spiral. Next, place your toppings in the center of your and—assuming you choose to place your seaweed on the outside—stacked ontop the rice. Slice the giant roll into bite-sized slices with a sharp knife. Top your sushi with sashimi, avocado, and any other topping of your choice. If this all sounds like too much work and you would rather get delicious sushi made for you and enjoy it in a fine dining setting, stop by Nikko Japanese Restaurant and Sushi Bar! We look forward to seeing you.